hey i played through everything! It's pretty great and the smoothest fan-game experience i've had yet (romhacks+games). good job! This hack has come a long way. But, now you're at the League?! This is awesome! Is there going to be post-league stuff? 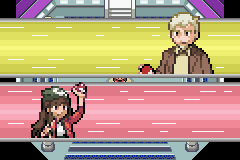 How many new Pokemons and Fakemons are there in gaia rom? Does anyone have information? I'm looking forward to playing through the demo. I love the whole premise and how many features there are. Thank you! There will be a postgame, but it will not be in v3. There are not any Fakemon, but Pokémon from Kanto, Johto, Hoenn, Sinnoh, Unova and Kalos all appear. v3.0 will be released on October 14th! It will go up to the credits, so will include all 8 Badges, the Pokémon League challenge and Champion fight, as well as the main story's conclusion. Also includes a list of unobtainable Pokémon! Also includes a list of Mega Stones, TMs and HMs, and where to find them! Notes: v3.1 is a bugfix update for v3.0 (changelog). Saves from v3.0 ARE compatible with v3.1. However, as with v3.0, saves from versions v2.5 or before of Gaia are NOT compatible with v3.1. 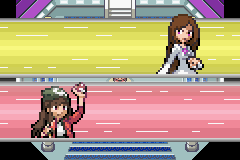 This beta ends after the credits roll in the Pokémon League, with all eight Gym battles, the full main story, and the Elite Four and Champion battles. Please read the included README.txt file for important information, or visit the Discord server in my signature. 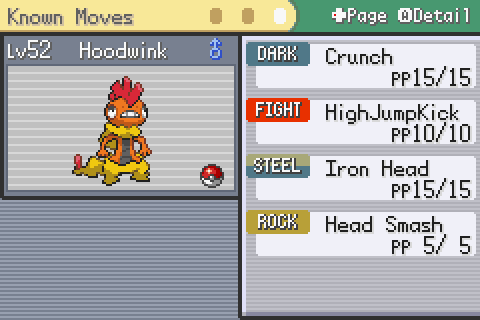 On top of the purely new content added to this release, a lot of content has also been added in between Gyms, as well as lots of bugfixes from Beta v2.5, balancing, and in general the hack has a greater degree of polish. Saves from previous versions are NOT compatible with this version. There is no postgame in this release; there is a v4 planned which will tie up the loose ends of the story, as well as feature two new islands-worth of content, and more items, Pokémon and legendary encounters. Oh man, It´s been a good while since I last played the beta, which was up to Telmurk city iirc. 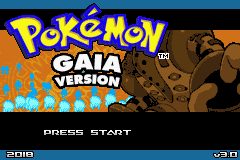 Even back then, I already considered Gaia the absolute best fan-game I've ever played. And though I haven't been keeping up, I really look forward to play the latest version! Just pushed out a small hotfix to the same download links which fixes the male player's cycling sprites which look glitched, and Horsea's back sprite which was positioned incorrectly. Finally it released. Can we use our old save file or we have to restart. I am fine with it though. Enjoying the hack a lot, a lot of attention has certainly been given to the small details and it makes for a great experience. Congrats on the release and great job on the finished product. Thanks for the kind reception! Note: make sure that it says v3.1 in the corner of the titlescreen. If not, redownload first. Notes: v3.1 is a bugfix update for v3.0. Saves from v3.0 ARE compatible with v3.1. However, as with v3.0, saves from versions v2.5 or before of Gaia are NOT compatible with v3.1. Hello, I know you guys maybe don't like people using cheats. But I'm having a hard time finding a place with cheats for the game with the new update. Do you guys know any? Finally! I had played Gaia v2.5 Beta back in 2016 and had absolutely fallen in love with it. Had been waiting for this and it was sooooo worth it. First off, good job to the team, man! The game was very enjoyable throughout, and never felt stretched or boring at all. 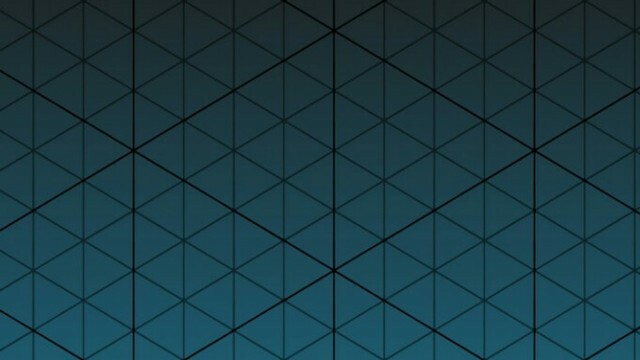 The mapping was very crisp; I especially loved the Loamas Field Tiles. The documentation provided proved to be very useful for finding TMs and Items before the Elite Four. The dialogue for everyone - even the Elite Four, was very well written. Elite Fours hardly get any time to make an impression, but their dialogue truly made up for it. I had noticed this back in 2016 too, that the game offers several VERY GOOD mons right from the beginning - Drilbur, Ralts, etc. I could have sworn that Nina's Gym had no "puzzle" at all when I played this back in 2016. (I could be wrong, but from what I remember, it was just a linear path. You beat a trainer, he melts down an Ice-wall for you. Then you beat the next Trainer and rinse-repeat.) So this means you guys also tweaked the older parts of the game. Good job! 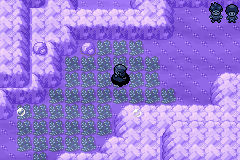 I remember wiping the floor at the Battle Marsh the last time but found it way more challenging this time around. The Rain Dish Ludicolo with Leech Seed and Protect really caught me off guard. I really enjoyed the story as a whole - Morgana's outlook on the reverence of Pokémon was very well written and genuinely believable. Almost reminded me of Ghetsis for a moment. Except Ghetsis was two-faced, which just makes Morgana really stand out as a GREAT villain because she actually believed in her goals and wasn't doing this as an elaborate cover-up for something even more sinister. When I heard that Herschel (sorry if I misspelled) was the only person to have ever mastered Molten Raze, I was convinced that he WAS the bad guy and was secretly helping the New Elders, so I was pleasantly surprised upon learning that he wasn't. 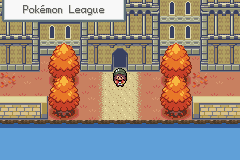 Finally, I especially would like to mention one battle which absolutely stood out - In Precimos Hotel, before obtaining the Tablet Idol that one burglar who tells you to be quiet and then proceeds to send out an Exploud and a Noivern - that was hilarious! The game relies a bit too much on HMs. I get that HMs themselves were improved a lot, but I assembled my Team of 6 right before the 2nd Gym and there was no Water-type in it. 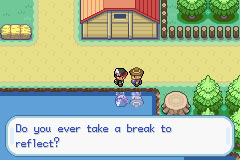 So, every time the game required me to Surf, Dive or Waterfall; I had to go to my PC to fetch my Tentacool. My team also didn't have a Flyer, but my Gardevoir had Teleport until reaching the Elite Four so that helped a ton. 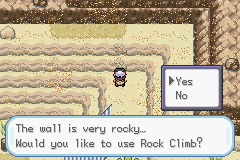 Also, there were kinda too many Rock Climb spots. 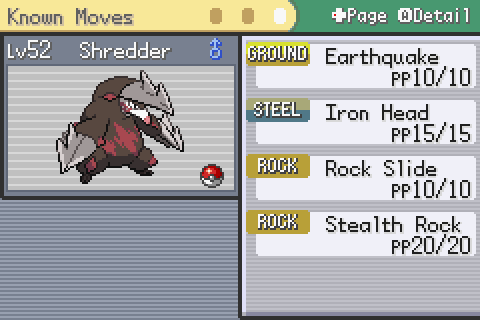 I was constantly heading to the Move Deleter to remove my Rock Climb afterwards. Basically, if HMs were made into Items... or even HMs were replaceable by other moves, it would have been much better. I accidentally encountered and caught the Rayquaza before the Elite Four. I was looking for the TM for Dragon Dance and went the other way and boom! Rayquaza. 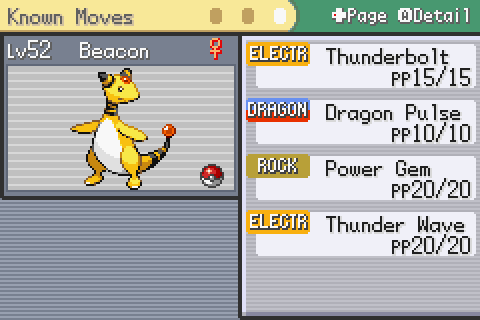 Thankfully, I didn't fail it and caught it in a Relic Ball after burning it, but I guess Legendaries in general could have been prevented by some NPC until you beat the Elite Four or something? Cause the Rayquay was Level 70 and the Champion's highest mon was Level 60. 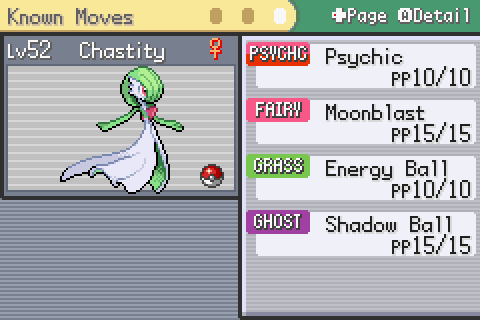 I mean, I didn't use the Rayquay in battle but damn, that was a very powerful crutch to be handed that early on. 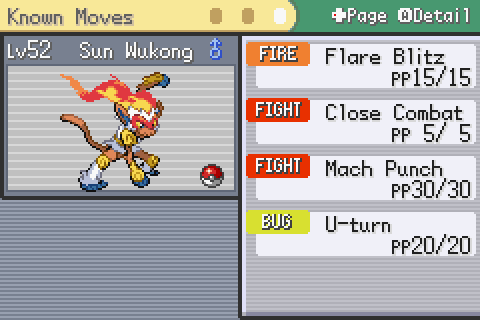 I know that the movesets are from ORAS, but I think a few changes here and there would have been nice. I mean, its weird how Ampharos, a Pokémon associated so much with light, doesn't learn some obvious light-inspired moves like Flash Cannon or Dazzling G-- ah, I mean Magic Shine. 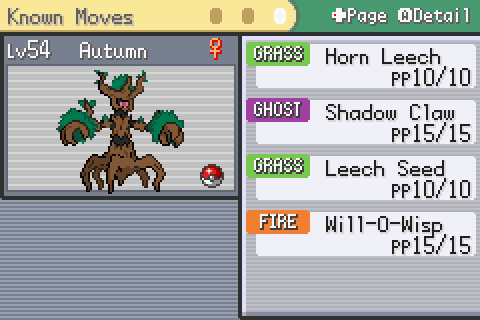 Also, Phantump really struggles until it becomes a Trevenant. Even then, I had to teach it Shadow Claw and Grass Knot and then had it relearn Horn Leech at Edashore. 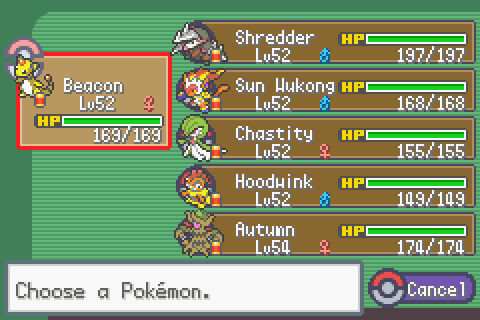 Maybe a Razor Leaf around Level 20 would have really helped. The Regigigas battle was... weirdly easy? Morgana's Regigigas kept using Crush Grip only. Against my Trevenant. That was slightly underwhelming. I Leech-Seeded and Will-O-Wisped it to death. Also, I'm dying to find out how Morgana got access to Molten Raze now. The fact that she also had a Salamence only who used it... Only later for her team to not have any Salamence makes me think that somehow it was Herschel's Salamence that she used. Whether he lent it to her not knowing what she'd do with it or she stole it, is questionable, really. But I don't think it was just the Tome by which she got Molten Raze. 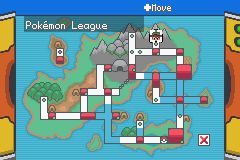 The last Gym's puzzle was... oof. Let's just say I spent quite a chunk of time to figure it out. The strength puzzle layout still haunts me in my dreams. Send help. What's that city with the museum called? Aerous right? Well, when entering one of the houses to the top-left of the map, before you reach Oppos' house, you'll momentarily see a bunch of sea tiles in the middle of the trees on the top-right of the screen. These tiles aren't seen from behind the house itself. Also, the Bicycle shop has a "location signpost" which I'm not sure is intended as most inside locations don't have one. I wonder when will I find the password for a certain lock in that city... By the way, love the hidden item locations. Are there any new additions in list of Mega Evolutions and obtainable mega stones. Btw, loved the game. Nice Work. While this is a bugfix update, there are still other, known bugs. To see the list of known bugs, please visit the #known-bugs channel of Pokémon Gaia's Discord server. It is kept up-to-date with known bugs, and also indicates which bugs have been fixed internally (that is, bugs which have been fixed but the fix has not been released yet in a bugfix update). If you find a bug not at this link, please report it either here, in this thread, or in the #bug-reports channel of Pokémon Gaia's Discord server. Notes: v3.2 is a bugfix update for v3. Saves from v3.0 and v3.1 ARE compatible with v3.2. However, as with v3.0, saves from versions v2.5 or before of Gaia are NOT compatible with v3.2. It was a great pleasure to finally be able to finish this game after playing the incomplete version a while ago. Mapping is superb. Pacing is strong. 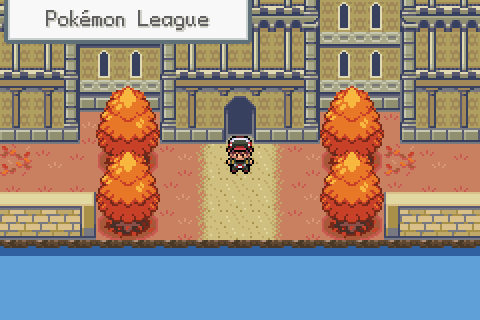 Story feels like something that would fit perfectly into the canon of offical okémon games. As a fan game creator, there's a lot to adore to here. Thanks for sharing your work with us! Been keeping an eye on this hack for a couple years now. Still haven't tried it yet (holding out for v4), but from what I've seen it looks very polished and made with a lot of care. I was also wondering how much original music will be in the final release? I love the Windmist City and Elder Knight themes and they really make Gaia stand out from other rom hacks. Still, great job, and I look forward to playing through the final release! Thanks for the feedback! Music-wise, it ultimately depends on how much our composer is available, which sadly isn't much these days. That being said, I'll be sure to share any new compositions if and when they're made! I've begun work on v4! First on my list of things to do was the title defense for the Champion! Take a look at a video showcasing the first Title Defense battle against your rival.